The 140 registered sailors, of 9 nationalities, already say goodbye to the competition today. The winners are those sailors who achieved, until the last test yesterday, the best scores. These days of competition have highlighted the athletes with better strategies in the water and more capacity to undergo pressure changes of wind gusts with mastery. The tests of 420 and 29er have been qualifying for the Spanish Championship that will take place in Vigo, for the class 420 and in Ibiza for the class 29er to be disputed in Easter. The winners in 420 are Elías Aretz and Pablo García (RCNGC) followed by Wichy Hernández and Nahuel Rodríguez (RCNGC) in second place. In 29er Andrés Barrio and Néstor Vega (RCNGC) have been placed in the first place, ahead of Alejandro Cantero and Jesus Garcia (RCNGC), within a short distance, after the three matches. In Radial Laser, come back from the winner of the Miami Sailing World Cup, the Greek Vasileia Karachaliou followed by the Lithuanian Viktorija Andrulyte and Felipe Monje from the Real Club Náutico de Tenerife. On the other hand, in Laser 4.7, Andrea Machado (RCNGC) was first, ahead of Nelly María González (RCNT) and Julio Jordán Bañón (RCNT), with fairly equal in water. In the catamaran class the Germans were unbeatable, capturing the first four places. In first position Justus Wolf and Maximilian Said, followed by Robert Schütz and Malte Nickels. In RS:X, Magüi Suárez (RCNGC) wins ahead of Luis Santa Maria (RCNGC) and Javier Rodríguez (RCNGC) and in Techno 293, Claudia Lorenzo (RCNGC) marked the difference followed by Eduardo Acevedo (RCNGC) and Raquel Calzada (RCNGC). For adapted sailing classes, the performance of Daniel Llaca and Ana Díaz Llaca (RCNGC) in Acces 303 Doble and in 2.4 mR, the skill of the Finns Janne Laine who occupy the first place, in front of his compatriot Anti Kokkala that of Moment is in second position. A competition that has tested the skill of the great sailors who met in the two championships. The 140 registered sailors, of 9 nationalities had to work hard today in the bay of Las Palmas de Gran Canaria. The first two tests of this Saturday were disputed with little wind of northwest direction, of about five knots, with many roles and with a race course difficult for all of them. The sailors had to be very attentive to the pressure of the wind gusts. The ones who took advantage of these streaks and their roles made a difference. When competitors started the third race the wind rose to 8 knots with flat sea and sun. The 420 and 29er events of today and tomorrow are also part of the Canary Championship of these classes, qualifying for the Championship of Spain to be held in Vigo, for class 420 and in Ibiza for class 29er to be played in Easter. In 420 the sailors Elías Aretz and Pablo García (RCNGC) dominate the provisional results very close to Wichy Hernández and Nahuel Rodríguez (RCNGC). In Radial Laser, come back from the winner of the Miami Sailing World Cup, the Greek Vasileia Karachaliou who today was placed first after a very disputed sleeves with the Lithuanian Viktorija Andrulyte (RCNGC), that finishes second today. Both eliminated to Felipe Monje (RCNT) that in this day has obtained less punctuation than expected and occupies the third place. On the other hand, in Laser 4.7, Andrea Machado (RCNGC) goes first, ahead of Nelly María González (RCNT) and Julio Jordán Bañón (RCNT), with fairly equal in water. A competition that has tested the skill of the great sailors who meet in the two championships. Tomorrow all classes will return to the water, to dispute the final day from 11:00 in the morning, which is predicted even more complicated because of the weather. Outstanding performance by Felipe Monje Escolar, Real Club Nautico de Tenerife, in Laser Radial, followed by Viktorija Andrulyte who took the lead during the first two tests of the day but, in the latter, lost the lead. Third is currently the winner of the Miami Sailing World Cup, the Greek Vasileia Karachaliou, who although had a bad start with a sixth in the first leg, but managed to climb positions in the last two tests sailed today. A competition that has been very close, specially among the sailors who occupy the top positions. Light rain at times and wind of 18 to 20 knots of the northeast have predominated in the first day of the International Carnival Regatta. Tomorrow all classes will compete. This event, organized by the Real Club Nautico de Gran Canaria is, at the same time, Championship of the Canary Islands of the 29er and 420 classes and is also qualifying for the Championship of Spain to be held in Cadiz at the end of February. There are 140 sailors from 9 nationalities who compete in the water and who tomorrow will face somewhat harder weather conditions, with a change in the direction of the west wind and rains that can be intense. Great sight of international and local fleet in the Bay of Las Palmas. Seven races held during two days of competition have put the best possible highlight in the bay of Las Palmas during the journey today. The Laser Radial classes, Laser 4.7 and 420, were represented in the water by young sailors from 6 different nationalities with the desire to demonstrate their high level and their desire to offer very good strategies in the water. Full in the first positions of this Regatta for the young sailors of the Real Club Nautico de Gran Canaria, reflected in the victories of Ismael Iess in Laser Radial that showed great skill and know-how in the water and did not yield his first position since the beginning of The competition in the different races. Meanwhile, also very regular in all tests and winner in Laser 4.7, Margarita Iess and undisputed in the water and setting the pace at all times, Elías Aretz along with Julio Alonso winners in 420. Of note is the good role of the Greek Vasileia Karachaliou, who finished second overall in Laser Radial and girls first, followed by Norway’s Line Flem Host. There was only one turn and change of positions among the sailors of Laser 4.7. After Iess was placed Tomás López Valle and as third Maria Mateo Ferragut who lost a position with respect to the first day of competition. All of them belonging to this Club. In 420 the first positions didn’t move since the opening day. After Aretz and Alonso in 420, the crew that remain in the second position are Vichy Hernández and Nahuel Rodríguez and thirds the sisters Maria and Pilar Caba Hernández, also of the Real Club Nautical of Gran Canaria. South wind that started with 12 knots, went up until 18 knots during most of the competition, and decreased again until 12 until the end of the regatta. The young sailors of class 420 had more stability of winds in the races disputed this Thursday while those who participated in Laser Radial and Laser 4.7 did suffer some instability in the third and last race of today, having thus to face much skill and ability to achieve the best possible score. It should be noted that the gentle temperature and the short wave helped in each test. There were bright moments in the capital’s bay, a distance of two windward-leeward laps, between the Insular Center of Sports and the Muelle de Vela Latina. Both the fleet that enjoyed these days of competition as the organizing committee are very satisfied with the show offered by the sailors in this New Year’s Regatta. The New Year Regatta is included in the Winter regattas program in Gran Canaria and is scoring for the Atlantic Olympic and Youth Series. It is organized jointly by the Royal Yacht Club of Gran Canaria, the Canarian Sailing Federation and the Insular Sailing Federation of Gran Canaria and is sponsored by Gran Canaria Sailing Academy and Naviera Armas. The bay of Las Palmas de Gran Canaria has welcomed sailors from six countries on this first day of the New Year Regatta. Twenty-six outstanding young athletes compete in Greece, Hungary, Norway, Switzerland, Romania and Spain. During the day, sailors competed in one fleet and it was possible to finish 4 tests. The sailing course was located in the Insular Center of Sports and the Muelle de Vela Latina. The good weather conditions made the sailors feel comfortable and offer a great show on the water. The tests were developed with wind component south of intensity between 14 and 17 knots and short wave. Laser Radial competition in the disputed legs, always had the top three positions taken over by the same sailors from the start. The first place was awarded by the sailor of the Real Club Náutico de Gran Canaria, Ismael Iess, second was the Greek Vasileia Karachaliou and third was the Norwegian Line Flem Host. In Laser 4.7, Margarita Iess was the winner today. In second position and very regular also in the water, Maria Mateo Ferragut and the third place went to Luis Wanguemert. The three young sailors belong to the Real Club Nautico de Gran Canaria. In 420 class, the first three crews are also sailors of this Club. First, Elías Aretz and Julio Alonso who showed a good approach when sailing and were very regular, followed closely by Wichy Hernandez and Nahuel Rodríguez. The third place was for the sisters Maria and Pilar Caba. For tomorrow, three more races are planned for this first competition of the new year in the Club. The “New Year’s Regatta” will conclude this Friday and will receive trophies the top three classified in each category. Every year, a large number of international sailors, choose Gran Canaria to train in winter, due to the good weather conditions and the excellent facilities that are put at their service. Of course we also have the presence of some of our best sailors of the local fleet who especially enjoy sailing at home. Samuel Beneyto from Real Club Náutico de Gran Canaria is the winner followed by Arnau Gelpí from CN El Balís and by the Swedish Calle Lagerberg. Due to bad weather conditions, strong winds and waves, the Race Committee decided, at 13:30 hours today, to end the competition. Therefore, after four tests played in the previous days, the 31st edition of the AECIO Trophy has Samuel Beneyto, of the Real Club Nautico de Gran Canaria, its winner being more regular and leading every day in the water. Who has also had a brilliant performance is the winner of the AECIO Trophy last year and second on this occasion, Arnau Gelpí of the CN El Balís. The third place goes to Sweden, as it is Lagerberg Street that occupies this position. The first classified of the girls, is the Russian Alexandra Lukoyanova (who was eighth in the general), second the Canary Islander of the Real Club Nautical Carmen Losantos and third Julia of Juan. Weather conditions became, along with the about 150 children from 7 countries, one more protagonist since Monday, December 26. Team spirit was the keynote among all the girls and boys. The best results came to those who were favored by strong winds of more than 18 knots in some moments. There are trophies for the first five ranked absolute, the first among the under 11 and 13, and the first three girls. The AECIO Trophy plus the Canary Islands Cup to be held in Lanzarote from March 4 to 5, will serve to select the 20 members of the Canary team who will participate in the Spanish Cup. Therefore, it’s included within the calendar of the Canary Islands Sailing Federation. This Trophy is also the second regatta of the Circuit EXCELLENCE CUP which consists of a series of international races organized in Spain. Circuit that is directed by the National Optimist Class Association and also belongs to the Calendar of the Real Federación Española de Vela. In addition, the AECIO is included in the Canary Islands Circuit Optimist Class, composed of 4 regional qualifying regattas that are played during the season and one more that is held in Tenerife. Samuel Beneyto from RCNGC continues leader, Arnau Gelpí from CN El Balís takes the second position and third is the Swedish Lagerberg. After the second day of competition, Samuel Beneyto (RCNGC) does not give up the leadership (RCNGC) followed by Arnau Gelpí (CN El Balís), winner of this competition last year. The third place has been for the Swedish Calle Lagerberg in the only race that could be made today. The harsh weather conditions have marked this second day of competition in the 31st edition of the AECIO Trophy. The strong wind in the early hours of the morning and the great swell in the bay of Las Palmas de Gran Canaria, delayed the beginning of the competition. Finally, thanks to the wind down to 12 knots, at 4:00 p.m., the yellow group started and at 4:10 p.m., the red group. This leg ended with 8 knots of wind. The best strategies among the sailors were the ones that gave them the best results in the overall results of this Wednesday and the race course was located in front of the area of the courts of the capital of Gran Canaria. Since yesterday we can say that there are 7 nationalities represented in this important competition, as one of the children competing has preferred to do so under the flag of their country of origin, Finland. Therefore, the countries that compete until tomorrow in the waters of our coast are: Sweden, Russia, Belgium, Poland, Ireland, Finland and Spain. Regarding the Autonomous Regions we have sailors from Galicia, Catalonia, Valencian Community, Cantabria and Baleares. 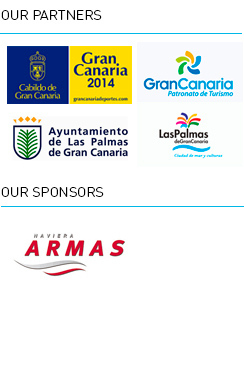 From Canary Islands we have representation of several clubs of Gran Canaria, Tenerife, Lanzarote and Fuerteventura. There are four tests that have been made since the beginning of the competition counting today’s discard test for the sailors. Samuel Beneyto of the Real Club Náutico de Gran Canaria was shown as the most regular making three first and winning each leg sailed today. The nearly 150 children sailors who gathered in the bay of Las Palmas de Gran Canaria to compete for the 31st edition of the AECIO 2016 Trophy competed in three hard-fought legs with 18 knots of south wind and large waves during the first two tests. Hard conditions, specially for the youngest, between 10 and 11 years. The last race disputed today counted on something less of wind, 14 knots and also with waves of smaller size. The favorites lead the provisional results, being first Samuel Beneyto of the Real Club Náutico de Gran Canaria, that obtained three first, second is Eduardo Ojeda, also of the Real Club Náutico de Gran Canaria that obtained a fourth, a second and a first. Third today, the winner of the AECIO a year ago, Arnau Gelpí, of the Club Nàutic El Balís. The regattas of the opening day provided bright moments in the bay of Las Palmas de Gran Canaria. The regatta course, in front of “San Cristóbal” neighborhood, offered a good show with all sailors in their Optimist boats. The fleet competed in two groups, yellow and red. Looking forward to tomorrow they will regroup again, based on the provisional general results. Today it was necessary to wait a few hours to start the competition. Finally, at 13:15, the first race was released. Tomorrow we expect weather conditions very similar to those experienced today, with waves and winds of between 15 and 18 knots south-southeast. The bay of Las Palmas de Gran Canaria crowned the winners of the “Semana Olímpica Canaria de Vela”. The XVIII edition of this competition has put the finishing touch to 4 days of competition in which the fight for the top positions was the general trend in each of the 11 participating classes. The 150 sailors from 13 countries that gathered at the Real Club Náutico de Gran Canaria to participate in this prestigious and consolidated regatta and offered a demonstration of quality and ambition in the water. Two active regatta fields filled the capital bay. With winds up to 15 knots, in which the participating sailors, including Olympic medalists and diplomas, world and European champions – and international top athletes – have elucidated the final winners of the event. In Laser Radial Women the victory was for the Greek Vasileia Karachaliou ahead of the Lithuanian Viktorija Andrulyte and the representative of the Club, Martina Reino. In Laser Radial Men category Álvaro Valido won Kevin Cabrera, who finished second and Ismael Iess, third. Joel Rodríguez did not leave the leadership since the first day in the Laser Standard class followed by his greatest rival and teammate, Joaquín Blanco Albalat. After the members of the Royal Yacht Club of Gran Canaria, the Lithuanian Karolis Janulionis was classified. In the RS: X 8.5 class, Javier Rodríguez achieved the victory with the same points as Magüi Suárez and only eight points away from Luis Lucas Santa Maria. In Techno 293 OD, the sailor Claudia Lorenzo was the winner followed by Cristina Marcello and Eduardo Acevedo. Elias Aretz and Pablo Garcia in 420 did not leave the first place from the first day of competition, achieving a comfortable victory over the rest of fourteen participating crews. Following the winners, the couples formed by Wichy Hernández-Nahuel Rodríguez and Patricia Reino-Carlota Hopkins. Like the class 420 winners, the crew formed by Andrés Barrio and Néstor Vega, remained at the head of the 29er class, followed closely by the Norwegian Alexander Klippenberg and Jeppe Nilsen and by the Sisters Paula and Elena Barrio. Class F18 was dominated by representatives of Germany. The winners were Helge and Christian Sach, in second position Justus Wolf next to Max Said and third Robert Schütz with Vreni VonderWülbecke. The current champion of Europe, Gustavo del Castillo with his crew Felipe Llinares, finally managed to impose on the crew formed by Rafael del Castillo-Helenio Hoyos and Fernando Marrero-Samuel Diaz. Finland’s Anna Liisa Oxby finished first, ahead of compatriot Jussi Ahlstrom and Kimmo Pasanen in 2.4mR and Hansa 303 Double the victory was scored by Rosa Padrón-Luis Poladura, ahead of Daniel Llaca and Ana Díaz. The price giving ceremony took place in the halls of the Real Club Nautico de Gran Canaria and put the end to the Canary Olympic Sailing Week, which has proved a sporting and organizational success according to the words of the sailors and coaches. This year, as a novelty, it’s worth noting that a special trophy will be awarded to the absolute winner. It takes the name of Manolo Pazos, a magnificent coach who obtained for this Club the greatest triumphs in the world of sailing. The winners of this award were Elias Aretz and Pablo Garcia, in 420. They achieve this trophy after having evaluated, among other factors, the number of participants in their class and who have performed a large number of tests. Vasileia Karachaliou and Joel Rodríguez first in the Olympic Laser Radial and Standar categories. This Monday was the third day of the XVIII Canary Islands Sailing Week, with winds of between 12 and 15 knots that allowed the celebration of three more races. It remains open for the last day when the names of the winners will be decided. This Monday, equator of the competition, was the day to discover how many sailors maintained the leadership. The Greek Vasileia Karachaliou snatched the first position to the Lithuanian Viktorija Andrulyte after the races disputed today, in a fierce test of Laser Radial. Intrepid in the water, Joel Rodríguez who continues in the first place of Laser Standard, followed in the general classification by the Olympic sailor Joaquín Blanco that has greatly improved his score today in the contested sleeves. There were changes in the first places of RS: X that today has Javier Rodriguez as first, relegating to the second position to which the previous two days led the classification, Magüi Suárez. In the Techno 293 OD category, the sailor Claudia Lorenzo is followed by the canary Cristina Marcello. Without giving space to his rivals Elias Leonard Aretz and Pablo Garcia in 420, one more day, they go home as leaders and in 29er continue to hold the first position the pair formed by Andrés Barrios and Néstor Vega ahead of those who follow close since the first day of competition, Norwegians Alexander Klippenberg and Jeppe Nilsen. As in previous days there are no changes in the top positions in the F18 category where the Germans continue to lead the standings without giving more options to the other participants. The first, once again, Helge and Christian Sach and in second position Justus Wolf next to Max Said. In relation to the meteorological conditions the tests have been developed with a spectacular day of sun, north wind of between 12 and 15 knots and without waves which has allowed to offer a very lucid regatta that all sailors enjoyed. Organized by the Real Club Náutico de Gran Canaria, the Canary Olympic Sailing Week has already celebrated 58. Tomorrow we expect an exciting journey for the 8 categories that are missing to have a winner.